We’ve all been asked what essentials we’d take on a deserted island. But what would keep us safe, and sane, while living alone in paradise? We have all seen the movies or read the books where the main character is stranded on a desert island with little to no supplies, only to use their quick wits and ingenuity to escape. So let’s take a look at some essential items to take with you on a deserted island. That is, of course, if you can’t find a way to book a flight on Skyscanner to get out of there. A big old knife is the first on our list of essentials to bring to a deserted island. Like one that Crocodile Dundee would have. Not only could it be used for protection, but also to hunt! Fish are a very healthy protein choice, and having a net will be sure to make catching them easier. Think you have what it takes to be a island adventurer? Book a flight to The Bahamas for an amazing experience. Who wants to start a fire by rubbing two sticks together? Why not ensure you will always have a campfire to relax beside by bringing a giant box of matches with you to your deserted tropical paradise. Alternatively, book your flights to Mauritius and let someone else worry about taking care of your vacation. 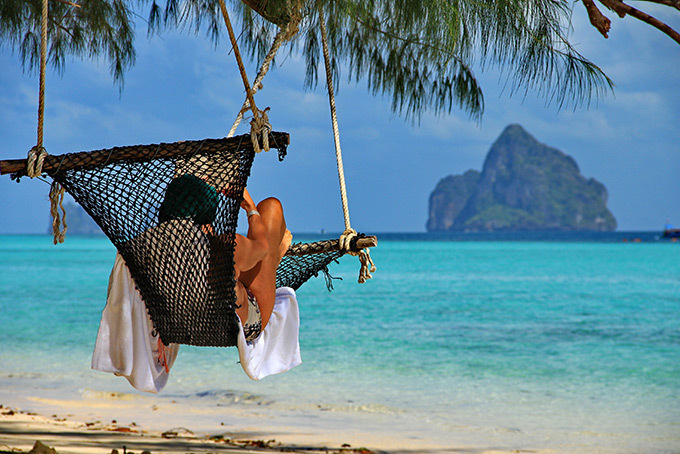 Most deserted islands are filled with trees, and a hammock would provide a comfortable place to sleep those lonely nights away. If you have ever spent any time in the tropics you know how much you need bug spray, and why this makes our list of essentials to bring to a deserted island! Nothing is worse than being stranded on a deserted island, except for being stranded on a deserted island and being sunburnt. So you can row, row, row your boat, merrily to freedom. Not just any flashlight, but one of those ones that runs when you wind it up so you don’t need batteries. It doesn’t have to be fancy, it doesn’t have to be expensive, but a spear would make life on the island so much easier! This item also comes in handy if you are spear-fishing while enjoying an island vacation in The Maldives. A satellite phone is a cellphone that can be used anywhere in the world, as long as there is a clear line from the antenna to the sky. The cost may be pricey (around $1,500 for the phone plus a $30-50 monthly fee). But if it gets you a better fate than Gilligan and his friends, then it’s definitely money well spent! Looking for that island getaway?